Dr. Alexander R. Gaudio was Connecticut’s first retina-trained subspecialist. 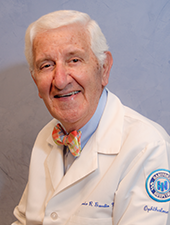 He commenced a private consultative practice in Hartford in 1971, and was subsequently the founding member of a group of consulting ophthalmologists. In December, 2003, he left that group to join his son Paul in establishing Eye Disease Consultants, LLC. Dr. Gaudio is an expert in degenerative retinal diseases, and was an active member of the electroretinography service at the Massachusetts Eye and Ear Infirmary, Harvard Medical School. He has lectured extensively on vitreo-retinal diseases in the US, Europe and Asia.